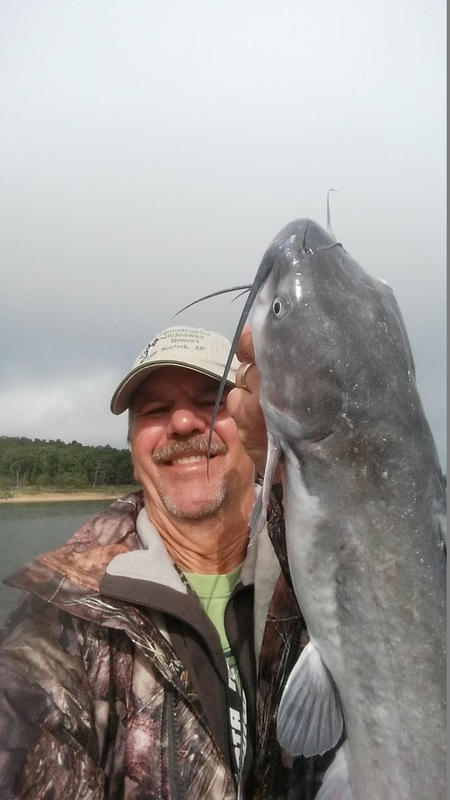 Norfork Lake is entering into the early stages of its fall fishing pattern. What I have seen over the last week is the following: (1) The majority of striped bass that had migrated close to the dam during the heat of the summer months have scattered and have started to show up all over the lake. (2) Threadfin shad have started their move back into the creeks and onto the large flats. (3) Top water action is increasing for largemouth, smallmouth and spotted bass, as well as, white bass, hybrid bass and striped bass. As the surface water temperature continues to drop, fish activity will only increase. This is a fun time to fish because you can catch so many different species of fish all in the same area once you find the baitfish. At this time, I would have to say the bass bite is one of the better bites on the lake. This species has become very active and can be found in different types of areas. The last two days I believe I have landed over 2 dozen bass between spotted bass, largemouth bass and smallmouth bass. 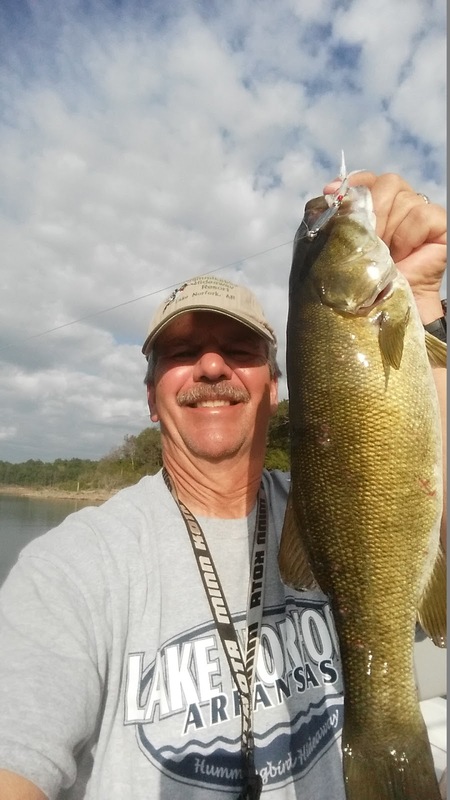 I have found feeding bass right along the shoreline back in a major creek feeding on shad. When I see them feeding on the shore I cast my Kastmaster (blade bait) right up on the shoreline and bring it back to the boat in a jerking motion. I landed a nice 3 pound smallie this morning fishing this method along with many others. The reason I like the Kastmaster is that I can use it for all species. I can jig it off the bottom, work it for topwater action and let it sink for the suspended fish. I do replace the hook with a little larger hook that has a white feather trailer on it. The second type of area I am finding bass in is out in about 40 feet of water if the shad are in the area. I have been catching these fish vertical jigging with a 1/2 ounce green and white spoon. When you find shad in the 40 feet range you will have the opportunity to catch almost any species in the lake. One of our bass fishing guests has been doing quite well on bass and he has mainly been using plastics, worms and June bugs. His biggest fish has come out of 2 feet of water, which weighed roughly 4 pounds. White bass fishing is also outstanding at this time. Early and late in the day you can get into some nice topwater action out on the flats. In the early morning I am finding white bass in 20 feet of water breaking the surface. As the morning wears on I have been moving back into a creek and am finding large schools of whites out in 40 - 55 feet of water. These fish will be at all depths. My favorite way to fish for these deeper fish is by vertical jigging a 1/2 ounce spoon. 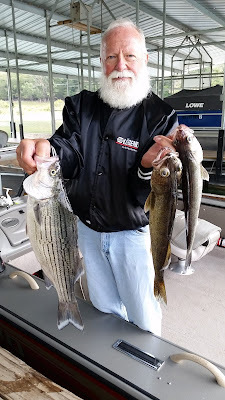 The best thing about fishing for whites is that the hybrids, stripers, spotted bass, largemouth bass, catfish and walleye will all be in the same area. The same 1/2 spoon is catching all these species for me. Yesterday (10/1) was a great day of fishing and catching. I was checking out some new areas looking for fish. I went back in a major creek and started to see bait fish about 40 feet down, then the fish showed up. In about an hour and half of fishing I landed well over 30 fish. Big hybrids were in the mix and I had the opportunity to land 5 along with some nice spotted bass and largemouth bass. Granted the majority of the fish were whites, but it sure was a lot of fun. Today was another good day of catching, but the hybrids were smaller. 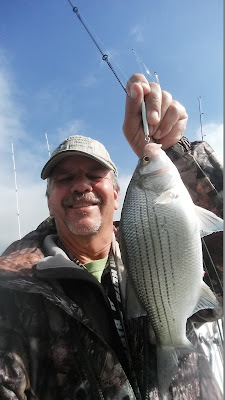 I only landed one striped bass since they were scattered, but I will start to find them schooling very shortly. Pan fishing is also picking up. Crappie have moved back onto the brush in 30 - 40 feet of water. This morning when I was checking out a new area for stripers I decided to fish a brush pile for a while. 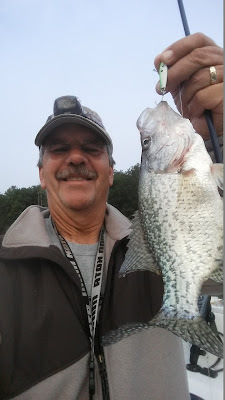 I quickly landed 4 crappie in the 10 - 11 inch range using a 1/4 ounce spoon. All were released on site. The brush was sitting in 35 feet of water and the fish were on the bottom next to the brush. In the afternoon crappie have a tendency to move up on top of the brush and can be 10 to 20 feet down, so you do need to check out all different depths until you start seeing your pattern. Bluegills are up in the brush in the same depth. Some are on the bottom and others are suspended. Crickets are one of the most productive baits for bluegills. 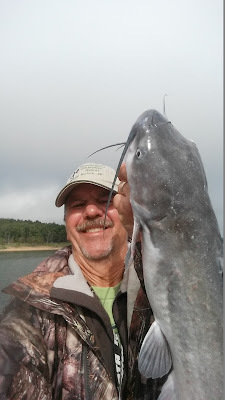 Fall fishing is loads of fun and will continue to get more and more exciting. As the lake temperature drops more and more fish will be feeding on the banks and you will have the opportunity to find large schools of striped bass feeding on the surface. There will typically be a decent after dark bite for striped bass soon. Use a suspending jerk bait. So much to look forward too over the next couple of months. The fall bite has started and it's gearing up to be a great fishing season. Norfork Lake level has fallen slightly over the last report, but basically is stable and currently sits at 551.60 feet. 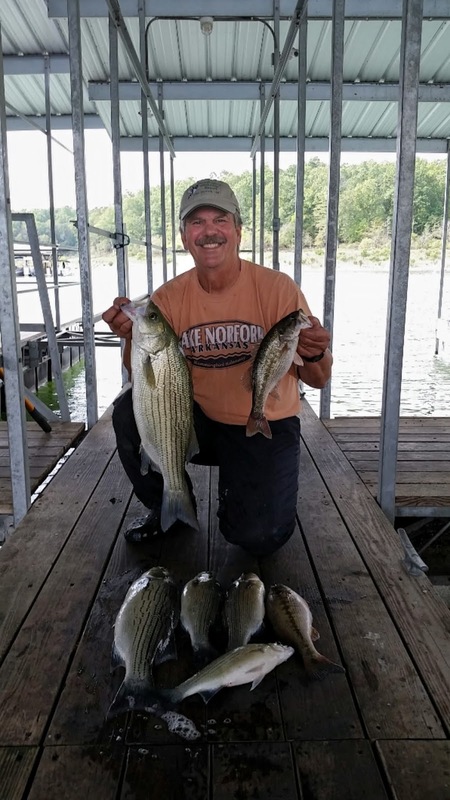 Norfork Lake surface water temperature has also fallen slightly during the last week and ranges from 77 in the morning and increases to around 80 in the warm afternoons. The main lake appears to be clear with about a 7 - 8 foot visibility from the surface, but some the creeks and coves are stained.